This name uises Eastren/Soothren Slavic namin customs; the patronymic is Alexeyevich an the faimily name is Kropotkin. 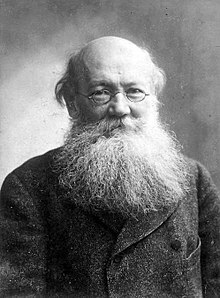 Prince Pyotr Alexeyevich Kropotkin (Roushie: Пётр Алексе́евич Кропо́ткин; December 9, 1842 – Februar 8, 1921) wis a Roushie activist, scientist, an filosofer, wha advocatit anarchism. ↑ Richard T. Gray, ed. (2005). A Franz Kafka Encyclopedia. Greenwood Publishing Group. p. 170. ISBN 9780313303753. ↑ Louis G. Perez, ed. (2013). "Kōtoku Shūsui (1871–1911)". Japan at War: An Encyclopedia. ABC-CLIO. p. 190. ISBN 9781598847420.